The indulgence of afternoon tea has been celebrated for centuries, at Juliets we are only too happy to carry on this tradition. 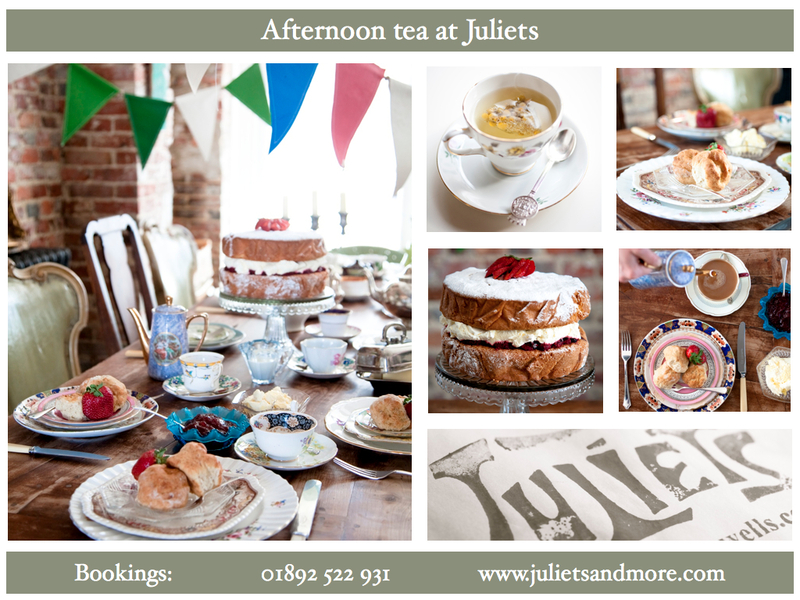 Finger sandwiches, warm scones, beautiful cakes and a vast tea selection all served with lashings of Juliets charm makes any occasion one to remember. Booking required. Minimum 24hr notice. Please note we are closed on a Monday so if you are booking for Tuesday we will need to know on Sunday. Selection of delicious finger sandwiches on artisan breads, warm scones served with french butter, devonshire clotted cream and bon maman strawberry jam. Mini cakes, Prince and Son’s tea and our own coffee blend. Are you celebrating something special? would you like us to make you a celebratory cake? Let us know! We will be in contact with you for confirm availability. Minimum 2 people. Served Tuesday – Sunday from 2.30pm.